Israeli Air Force targets several terrorist-related sites in Gaza after terrorists fire a rocket towards Ashkelon. 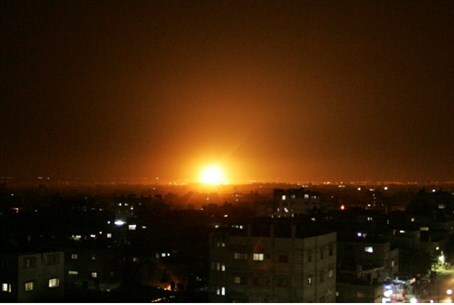 The Israeli Air Force (IAF) targeted several terrorist-related sites in Gaza on Monday night. In a statement, the IDF Spokesperson said the airstrikes targeted a center of terrorist activity and a weapons storage site in southern Gaza, as well as two other weapons storage sites, one in central Gaza and one in northern Gaza. Direct hits at the targets were identified and all aircraft returned safely to their bases, the statement indicated. The airstrikes came in response to a rocket attack on southern Israel on Monday evening. The rocket, fired from Gaza around 11:00 p.m., exploded in an open area in the city of Ashkelon. There were no physical injuries or damages in the attack. "The IDF will not tolerate attempts to harm Israeli citizens and IDF soldiers, and will operate against anyone who uses terror against the State of Israel," the IDF statement said. Monday night was the third night in a row that the IAF launched airstrikes on Gaza. On Sunday night, IAF airstrikes targeted a terrorist center and three weapons storage sites in northern Gaza. Also targeted was a terrorist center in southern Gaza. These airstrikes came hours after Gaza terrorists fired two rockets towards the city of Ashkelon. The rockets were intercepted by the Iron Dome anti-missile system before they exploded in populated areas. On Saturday, four rockets were fired from Gaza, causing no physical injuries or damages. The Israeli Air Force (IAF) later retaliated by launching airstrikes against terror targets in Gaza.